Jim believes that art should be for everyone, and without explanation. He is an artist who revels in the freedom of his eclectic education. 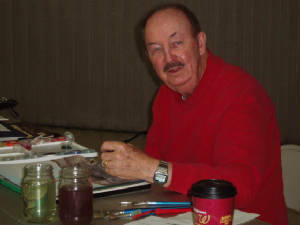 He is Florida-based and specializes in watercolor media. Three of his abstract paintings were selected for the 2012 publication “Eyes On: Abstracts” by Blaze Hill Press. Jim has held solo exhibits at the City Hall in Apopka Florida, the Orange County Library, and the Apopka Historical Society. Jim’s paintings have also appeared in an exhibit at the Sidonie mansion and in various exhibits by the group “Artists of Apopka”. One of Jim’s floral paintings was selected for the Central Florida Watercolor Society display at Leu Gardens, Winter Park Florida. Jim is a member of the Central Florida Watercolor Society and the Florida Watercolor Society. Just finished two fantastic tutorials by Susie Short. One was on how to paint waves and the other was on how to paint Christmas cards. 07/5/12 - Added new pages to my site.